The Eisenhower horoscope shows he was a Saturn exemplar. His greatest achievements came at a time when most men his age were winding down their careers and preparing for retirement. He embodied the best and highest functions of Saturn–the probity, the willingness to carry out the law in an ethical manner, the drive to keep the structure of free governments alive by bringing peace to the world. Though he was the oldest president up to that time in American history, in my opinion, he was one of the best of the 20th century. I wish to use Eisenhower’s life to describe Saturn’s influence in detail. Eisenhower, general of the allied armies that destroyed the Third Reich, had a Neptune/Pluto conjunction in the 10th house (a kind of shadow Saturn placement). If we use the birth-time testimony of his mother, Saturn was hovering somewhere around his ascendant. He wrote several books on history, including his most famous, and one well received by historians, Crusade in Europe. The Eisenhower horoscope shows a birth, October 14th, 1890, at “a little before three in the morning”, according to the family Bible.’ He was born under the Neptune/Pluto influence, one the most powerful of the synodic conjunctions. Many of his contemporaries were born under this aspect (the Pluto/Neptune conjunction-synod). Historical personages born under this aspect are often imbued with great powers. The nature of these powers can express themselves in numerous different fields such as economics, politics, the military, the religious and spiritual. Herein lies the power of a Caesar, an Augustus, a Moses, a Buddha. Many of those who participated in the events culminating in World War II had the Neptune/Pluto synod in their charts–Hitler, Churchill, Roosevelt, and many generals, including Rommel, Bradley, Guderian, and numerous division commanders of the allied army. Eisenhower’s ancestors were German. They emigrated from the Rhineland during the Thirty Years War (in 1741) to Philadelphia. Scholarship provides us with the record of a Hans Nicole Eisenhewer, a member of a religious sect, the Mennonites. This religious sect was hard working, industrious, thrifty. They were pacifists; their religious persuasion was transmitted through the generations to the parents of Dwight Eisenhower, David and Ida. Eisenhower grew up in a small Mid-western town, Abilene, Kansas. His family was deeply religious and as hard working as his ancestors. His father worked for $50.00 a month as a mechanic in a creamery. His mother worked just as hard bringing up a family of eight boys. He had a boyhood in which there were few class distinctions. Everyone was poor; no one knew they were poor. People worked hard, looked after their sick and elderly. Like all his contemporaries, young Eisenhower was taught to practice fair play. His parents guided his upbringing with discipline, but also with nurturing and love. He was assigned chores, which often took long hours. He was expected to perform well in school, and did so, receiving A’s and B’s through out elementary and high school. An energetic and high-spirited boy, he had two consuming interests. He loved sports of all kinds, playing football and baseball with a passion, and he became the best football player in high school. His other interest was an obsession. Nothing could stop him from reading military history. One day, when he was about ten years old, his mother locked his books away in the closet. He found the key to the closet and reclaimed them. He often got into fights, as did many vigorous boys of his time. His parents felt “boys will be boys”. It was a rule in the home, if the brothers got into fights with each other, neither parent would interfere. The brothers were always fighting. Dwight Eisenhower was known as a fearless fighter. He repeatedly assaulted and could out-wrestle his older , heavier brother, Edgar. Size made no difference to Ike: He fought till he dropped. He was thereby allowed to work out his aggressive instinct, intense drive, his essentially playful energy and enthusiasm (which astrologers call “a strong Mars”), which later helped him lead a massive army across Europe to destroy Hitler. As a student, he was brilliant in his studies; as athlete, he was popular with his team and his coaches. He was well-liked among his school mates. One notable trait Eisenhower displayed even in grade school was an ability to organize. He arranged hunting trips, parties, outings and events of all kinds. He had a gift for working with others in a co-operative effort. The knack of making it all fall together is an adult quality, but Ike employed it from his earliest years. His early history reveals some incidents which helped form the man. The first episode deals with the problem of rage (Mars). Dwight had just turned ten years old, and it was Halloween night. He requested permission of his parents to go “trick or treating” with his two older brothers, Arthur and Edgar. This request was denied. Dwight fell into an unrestrained, self-destructive, violent rage. He ran outside the house screaming, and began to smash his fists against the bark of an apple tree, rending the flesh of his knuckles, tearing it to ribbons. Finally, his father came outside, grabbed him by the shoulders, and shook him till his tantrum subsided. He entered the house crying and went to bed. Later, his mother entered his bedroom and rubbed salve on his hands. While wrapping them in bandages, she quoted to him these words from scripture, from Proverbs, “He that conquereth his own soul is greater than he that taketh a city.” She talked to him for hours about how anger can destroy everything in a person’s life. She told him that if he wanted to achieve anything, he would have to learn to control this anger. This experience was one of the most formative of his life. At the beginning of his freshman year of high school, young Eisenhower slipped and scraped his knee. His worry was not for his knee, for he was always getting into scrapes and bashes, but for the ruined pants. In a time that knew no antibiotics, the scrape became infected, he developed a fever, and took to bed. Daily, his condition worsened. A doctor was consulted, and informed the family that if the infection—which by this time had extended to the groin area—reached the stomach, the boy would die. It was the doctor’s recommendation that the leg be amputated. His family, his father and mother, being deeply religious, and somewhat distrustful of the modern medicine of that era, were unsure of the doctor’s advice. They were willing to go either way. Though Ike was semi-delirious, he understood that they were talking about taking off his leg. He adamantly refused to have the leg removed and demanded that his brother Edgar guard the room against the doctor. Edgar slept in front of the door entrance every night. Eventually, Eisenhower’s immune system fought off the infection. It took him two months to recover, and he had to repeat that year of school. 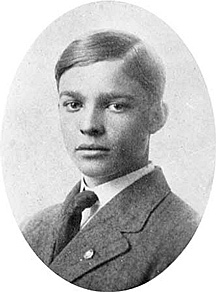 In 1909, when Eisenhower graduated from high school, he went to work in a creamery, first shoveling coal into a furnace, then as a hauler in the ice room, and finally as night manager, working from 6 P.M. to 6 A.M.–all to support his brother Edgar, who was attending law school at the University of Michigan. Their agreement was that Edgar would attend college for a year, then quit and support Ike who would then attend the college of his choice. Somehow this compact never worked out: Edgar never quit college. Eisenhower, following the urging of a close friend, applied for an appointment to the U.S. Naval Academy. The method in which one became a cadet, then as today, was to apply through the local congressman. So Eisenhower did this–he wrote a letter requesting an appointment. He never received a reply. A few weeks later, he read in the paper that a competitive test was to be given for theappointment. Eisenhower wrote his congressman a second time, requesting permission to take the test. This time he received the reply that he could take the test. The top two scorers were to be given the appointment. Ike came in second of the eight contestants. The high scorer chose Annapolis. Eisenhower took the appointment to the second choice, West Point, the U.S. Military Academy. Pursuing the Saturn archetype that dominated his life, Eisenhower had to earn his way, which he did in this case by achieving a score that put him in second place. He could not get his nomination freely, coming from political influence or connections. This is Saturn. Because he had to repeat a year, and because he took a year off to put Edgar through school, he passed the Academy’s entrance exams and entered at an older age than most of the other cadets. This is also Saturn. His older age worked in his favor at West Point. He was better able to handle the stress and punishment meted out to plebes or first-year cadets. At age 20, and after working for a year, he was a little stronger, more grounded, more familiar with the world than his peers. His younger roommate, who had been escorted to the train by a hometown band, dropped out of the academy after a few weeks. The pressure was too much. Eisenhower did well at the academy. His English was outstanding: It was an easy affair for him to write a high scoring paper a half hour before class. At West Point Eisenhower loved football. This is an athletic contest that requires physical skill and endurance, emotional control, and a sense of tactical and strategic know-how. Eisenhower had a surfeit of physical stamina and quick wits that he was able to apply to the game. Even in his freshman year, he became a first string player. And he was good. After four or five games, people began to notice him. The first time Eisenhower was mentioned nationally in American history was in a brief article in the sports section of the New York Times about a tight end who played the backfield, and had caught several key passes for a touchdown. He became a football hero to both his peers and to high army officers, who complimented him on his excellent plays on the field. Yet a flaw was beginning to come to light in his personality–hubris. Ike was getting arrogant, thinking and acting as if nothing in the world could touch him. On Nov. 9th, 1912, in a game against the Carlisle Indian School, Eisenhower secretly arranged with a fellow halfback to neutralize the star of the opposing team, who just happened to be Jim Thorpe, one of the great athletes of the early 20th century. The plan was to “high-low” Thorpe. Eisenhower would hit him high on one side, while his partner would tackle him around the shins; this procedure was guaranteed to disable the opponent for the remainder of the game. Eisenhower had tried this tactic on other players and it had worked beautifully. Ike and a fellow halfback smashed Thorpe to the ground. But the invincible Thorpe stood up, re-entered the huddle, and ran the ball for another first down. Army lost that day. Eisenhower had played “dirty”. He thought he could do something that was wrong, and get away with it. The next week, on Nov. 11, 1912, in a game against Tufts University, he was tackled and his knee twisted when he hit the ground. He was advised by the team doctor to stay off his knee for a few days. He did not follow the advice of his doctors, more evidence of hubris. Later, in the middle of the week, while performing an exercise that required him to jump on and off a moving horse, his knee crumpled under him again and became badly dislocated, ripping cartridge and tendons. He was laid up for a few weeks in the hospital, and when the doctor removed the bandages and examined the knee, Eisenhower was informed that he would never play football again. Many times in later life when under stress, that knee would again dislocate. Eisenhower was heartbroken. He suffered months of despair. Finally, he began to come out of it and involve himself in new activities. Instead of playing on the field, he became a cheerleader. Before each game, he would speak to the entire cadet corps, revving them up, so to speak. These talks were his first training in public speaking and invaluable to him for the rest of his life. He was also asked to coach a second string team, and later, he became a first string coach. The intervening of fate allowed him new activities that helped develop his gifts for organization, planning, motivating others, for cooperative efforts–all qualities he used later to command the army that would destroy Hitler. When Eisenhower graduated from West Point, he was commissioned as a Second Lieutenant and was assigned to Fort Sam Houston in Texas. Two notable events happened to him there. First, he met and married Mary Geneva Doud, popularly called Mamie. Ike and Mamie remained together for the rest of their lives. Secondly, after being so ordered by his commanding general, Ike again began coaching football teams, first at a local college, then with an army team. The local college team went from a five-year losing streak to winning most of its games that season, barely losing in the semi-finals. His reputation in the army as an outstanding coach began to spread. By teaching others, he was teaching himself motivation, organization, cooperation, and achieving goals. His training began, though he didn’t know it, at the very beginning of his career. On April 6, 1917, America entered World War I. During the war, Eisenhower rose in rank from Lieutenant to Major (actually, he was promoted to Lieutenant Colonel, but that was a temporary rank, and was later removed on August 31, 1920). Though a career officer, Eisenhower never went overseas to fight in France. This was a great sadness in his life, another of Saturn’s “slowing down” influences that seemed so terrible at the time, so beneficial to him later. Why couldn’t this brilliant, competent and courageous officer go overseas? From the beginning of his tour of duty as a Second Lieutenant, he developed the reputation as a good staff officer. He could organize; he could plan; he could make things run smoothly. The army needed his services at home—to set up training camps, to make sure that supplies arrived where they were supposed to, to establish workable routines and procedures. Eisenhower harassed his superiors in the War Department to send him overseas; all requests were denied. He was too successful at home. Finally, he was given the command of a tank battalion. His orders were to train the troops and then to take them to France. Starting out with no tanks, no barracks, no supplies, he built up a highly motivated military organization. On October 14, 1918, his birthday, he was promoted to Lieutenant Colonel (temporary), and he received the long-coveted orders to embark to France. His tank group would be part of a massive offensive that would begin in the next year. However, on November 11, 1918, the Germans signed The Armistice. The war was over. Eisenhower was in despair. He had never once engaged in combat. What happened? In the chart of a soldier, one should always examine Mars. All that year (1918) an inconjunct occurred from transiting Saturn to Eisenhower’s natal Mars. His plans were constantly changing: He would think he was headed in one direction, only to be informed later that he was going somewhere else. This inconjunct, activating his natal Mars biquintile Pluto, might be said to function as a” death aspect”. Possibly, if he had been somewhere on the front lines (and in every war he was in he was always where the firing was thickest), a stray bullet or piece of shrapnel might have taken off his head. 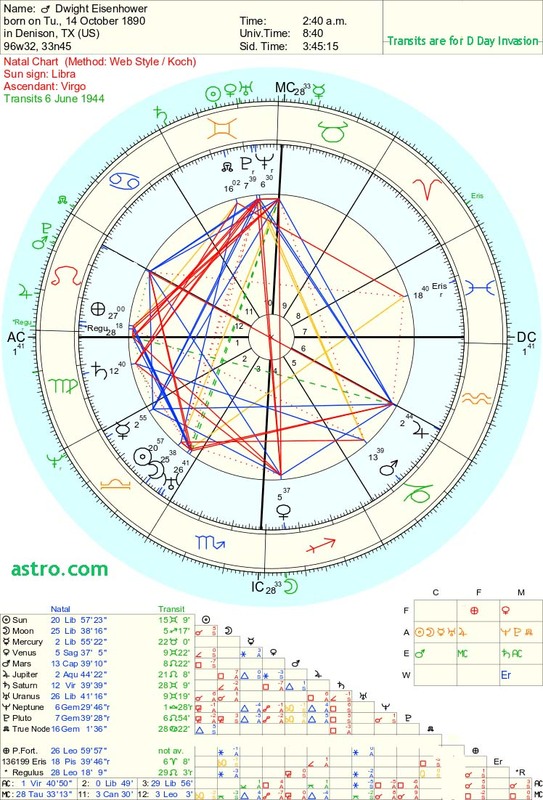 That aspect of separation from life existed in his chart. Perhaps it would have manifested in such a fashion, if he had been in combat. This was a Saturn “slow down” influence again at work in his life. It caused him suffering and depression while it was happening, but was later of great benefit to him and to the world. On July 31, 1920, Eisenhower was demoted from his temporary rank of Lieutenant Colonel, made a Captain, and then three days later, on August 2, 1920, was given the permanent rank of Major. He remained in that rank for sixteen years, a little over half a Saturn cycle. He decided to stay in the peacetime army, which was demobilized in size from two million men and women to around a hundred thousand. In the peacetime army, there were extremely few promotions and not much salary, but there were benefits—financial security and stability of lifestyle. Eisenhower continued to coach football teams. He was in great demand by base commanders. During this time Eisenhower and his wife traveled to Paris, where he was stationed for a year. He also spent many years in Washington D.C. serving as staff officer to General MacArthur, who in the 1930′s was Chief of Staff of the Army. His years in Washington as an obscure Army Major included working with Members of Congress on military appropriations, helping to devise a command structure for the Army, and many other activities in which he learned how Washington functioned with its politics and bureaucracies. During his slow years, all the other Eisenhower brothers achieved successful careers. His brother, Milton, younger by nine years and living in 1930′s Washington, was known as the second most powerful man in the Dept. of Agriculture. Edgar was a successful lawyer on the West Coast, and the others were prosperous businessmen. Influential Washingtonians with whom he came into contact made him business offers trying to entice him into private employment. Some of those lucrative propositions he nearly accepted; they promised him considerably more money than he was making, and substantially more prominence in the world. Ultimately, he refused all offers choosing instead the security and the stability of the Army. He told his close friends that he simply believed in serving, and that he had committed his life to serve in the Army. From the time he was sworn in as a new cadet (June 14, 1911) to the hour when the mantle of power began to fall onto his shoulders (March of ’41, when he was promoted to Colonel, the span of time measured was about thirty years. The actual Saturn cycle, that is, the time it takes to travel around the Sun, is 29.53 years. During this period, he applied his talents to an apprenticeship that required schooling in patience and slow growth. This often meant taking and carrying out orders from superiors with whom he did not agree and giving them credit for highly creative work that he had done himself. He worked for General Douglas MacArthur for a number of years. MacArthur called him “the best staff officer in the Army.” When MacArthur was asked to assist the Philippines in the creation of an army that would be able to resist the Japanese, he took Eisenhower along. Eisenhower didn’t want to go; his wife, Mamie, didn’t like the heat; he felt it would be a dead end to his career. Duty, however, was duty, and orders were orders, so out he went to the Philippines in the mid-thirties, helping MacArthur to build an army. Eisenhower thought MacArthur was a bombastic loudmouth, and that as Field Marshal (a Philippine Army rank) MacArthur had accepted too much money as a gift from the president of the Philippines. Eisenhower was also upset when his commanding general undercut his staff. MacArthur denied all Ike’s requests for transfer back into the regular army. Still, Eisenhower did not resign from the Army. He continued to serve because of…duty. In July of 1936, along with his whole West Point class, Eisenhower was promoted to Lieutenant Colonel. After serving so many years with MacArthur in the Philippines, according to Army regulations, Eisenhower had to move on to other duties. Not even his commanding general could keep him in the Philippines any more. He chose to return to the United States. By 1941, when he was finally promoted to Colonel and given command of a mechanized infantry battalion, he had served in the Army four months shy of thirty years. Let’s examine what he had learned. Though capable of seizures of anger, he had developed great control over his rages and could focus his anger constructively. He had become the best organization man in the Army. As a commander, he had the ability, natural and learned, of being able to motivate soldiers, and he was extremely popular with his battalion. He was able to work extremely well in cooperative efforts with his fellow officers. The lack of that ability to unite one’s energies with others in a friendly and supportive mode is one of the chief causes of the loss of battles all through military history. In the American Civil War, quarreling generals can be blamed for the Confederate retreat at the Battle of Shiloh following the death of General Johnston. This was also the cause of the retreat after the Battle of Missionary Ridge. It was a long, hard school Eisenhower had attended. But he evolved and matured, not in a day, but in thirty years, a complete Saturn cycle. In 1941 Eisenhower’s reputation in the Army, including his genius for planning and organization, was well known. Franklin Roosevelt had picked a general to coordinate the total war effort of the United States. His name was George Marshall. This general needed an assistant who could “get things done”. For Marshall that meant someone who could quickly solve problems on his own, who was not afraid to make decisions, who could organize people and their time. On December 12th, 1941, five days after the attack by the Japanese on Pearl Harbor, Eisenhower was called to Washington for a conference with Marshal. Eisenhower thought he would be returning to his battalion in a few weeks, so he asked his wife not to follow him. Disembarking from the train he headed straight for his interview with Marshall, where he was asked by the great man, “What should be our general line of action?” Eisenhower immediately replied, “Give me a few hours to study the situation.” And after the second interview, Marshall placed Eisenhower in charge of the Philippines and Far Eastern War Plans Division. From that point in time, Eisenhower swiftly rose in rank and popularity and status. In March 1941, he had been promoted to Colonel (temporary). In Sept. 1941, he was promoted to Brigadier General (temporary). On March 27, 1942, he was promoted to Major General (temporary). Then in July 1942, he became a Lieutenant General. On Feb. 10, 1943, he became a four star General; and on Dec. 16, 1944, by Special Act of Congress, he was promoted to Five Star General. This rank, like Grant’s promotion to Lieutenant General, was one of the highest ever awarded to a general (MacArthur and Marshall and Bradley were also given this rank). The long slow years were over. From 1941 to 1961, a twenty year Jupiter/Saturn span, Eisenhower became and remained one of the most powerful men in the world. In those few days before the Normandy invasion (June 6, 1944), in charge of an allied army poised to invade Occupied France, Eisenhower was the most powerful man in the world. One of the most important factors in this invasion was the position of the Moon and Earth and Sun, and how they were configured—because they ruled the tides, which had to be low in order for the landing craft to be able to discharge soldiers and equipment. To land the armies successfully in France, there were few windows of opportunity. One was at the end of the first week of June; the invasion force would have to wait three weeks for the next occurrence of a low tide. In early June of ’44, a violent thunderstorm swept the channel, one of the worst in many years. It threatened to disrupt the entire invasion. The decision to send the army to France or to remain in England rested on Eisenhower’s shoulders alone. A million men awaited his decision. Some on his staff counseled him not to send the invasion force across the sea; it was too great a risk. That night, June 5th, 1944, Eisenhower made the decision. Disregarding the extreme peril to his invasion force, he decided to take the chance, to risk everything. He quietly gave the order to his staff, “We go.” It is on such boldness that great empires are founded, that immense fortunes are built. Looking back, we know now that the next low tide window was three weeks later. At that time, an even more violent storm occurred, one which would have definitely precluded the invasion. Eisenhower had made the right decision. During this period of ascent-to-power for Eisenhower, transiting Saturn, in 1942 and 1943, was conjunct his elevated Neptune/Pluto conjunction. At the time of his promotion to Lieutenant General and later to full General, it was within one degree of orb of conjunction to his Neptune/Pluto. There were other influences happening in his chart during the war. Transiting Pluto sextile natal Pluto was the most prominent. It was present during all his most difficult battles. On Dec. 7th, 1943, after Eisenhower defeated the German army in North Africa, President Roosevelt visited the battleground. He informed Eisenhower that he was being appointed commander of the cross-channel invasion of France. One could assume that the co-operative component in the personality make-up found in his chart would involve that Neptune/Pluto opposition to his natal Venus. The mental brilliance he employed all his life in planning and organization would be found in his Grand Trine of Jupiter, Mercury, configured with the Neptune Pluto synod. Eisenhower’s Saturn transits offer us fascinating historical lessons. When Saturn by transit crossed his Neptune/Pluto synod in ’42 and ’43, a mantle of vast power fell on him. His power was to stay with him for the next twenty years. When transiting Saturn conjoined his natal Saturn (his second Saturn return), he withdrew for a while from the centers of power, and served as president of Columbia University in New York City. Then he was asked by President Truman to take charge of NATO, the North Atlantic Treaty Organization, as SACEUR, or Supreme Allied Commander Europe. As Saturn moved towards the conjunction of Eisenhower’s natal Sun, all across America a collective movement arose to make him president, an idea which he resisted at first, but finally found impossible to withstand. He ran for the office. On election night, Nov 8, 1952, when Saturn in its motion through the sky was within one degree of his natal Sun (it would cross back over it in June and July of the following year), he was elected president. Saturn crossing the Sun of a historical personage is, as we have said before, often an indication of an ascent to power. What kind of a president did Eisenhower make? The myth, of course, is that he was a nice guy, probably a good general, but kind of dumb around those smart Washington types, that he was manipulated by his Secretary of State, John Foster Dulles, that somehow he muddled through his eight years as president. Wasn’t America lucky that nothing worse happened? Ascent to Power Chart. Click for larger. The truth is quite different (please refer to the 1953 ascent-to-power chart nearby). For many years, he had administered large organizations, many of which were larger than America’s largest corporations. He was conversant with and knew intimately most of the world leaders of his era, including Charles De Gaulle, Winston Churchill and Joseph Stalin. He knew as much or more about military power—how it could be effectively employed, and how it should never be used—as any one human being on the planet. In the Thirties, he spent many of his quiet years working in Washington, D.C, interacting with the Congress, and he was thus aware of the political problems that involved stresses between the executive and the legislative. He could read men, he could assess their capabilities, he could easily fit the right man into the right job, and many of the appointments he made, as Supreme Commander, and as President, were brilliant ones. In all of American history he was one of the best qualified men ever to enter the executive office. There were several major problems he solved that the other candidates of the 1952 election (Taft, Dewey, and Stevenson) could never have solved. First, he faced the specter of war. The world had been at war in one place or another on the planet for almost twenty years. When Eisenhower was sworn into office as President, America had been at war in Korea since June of 1950. In history, sometimes it seems that when nations fight, and keep fighting for years, a certain mind-set develops: War as a way of life becomes so ingrained that it seems impossible to get free of it. That was the situation in 1953. The world was at war in places like Korea and Vietnam, and a cold war between America and the Soviet Union threatened to destroy human civilization. The world had been at war in one place or another for almost twenty years. In the U.S. Congress, Members both liberal and conservative, daily discussed the serious possibility of nuclear war with Russia. Politicians and generals and the media had a warlike mentality. War was supposed to be the solution for everything. During the election campaign Eisenhower promised that “I shall go to Korea.” This statement implied an agreement with the American people to end the Korean Conflict. It is interesting that when he made that promise in late October of 1952, that Saturn was exactly conjunct his natal Sun. Many historians feel that this is the time when Americans made up their minds to vote him into office by a large majority. After the election, but before his swearing-in, he made a secret journey to Korea. What he did there is indicative of how he ran his whole administration for the next eight years. He had an interview with the President of South Korea, Sigman Rhee, but it lasted for only one hour, and he made no promises, no commitments. The general in charge of the armies in South Korea, Mark Clark, asked the President-elect to review with him a battle plan that was supposed to push the Chinese army back up into China; Eisenhower would not even look at it. For the three days he was there he visited the front lines, talked with division commanders and common soldiers, and he learned what was actually occurring. The truth was is that a stalemate existed between the Chinese and American (and U.N) forces. Without the addition of at least a hundred divisions (one division equals about 20,000 men) or more, a number that the Chinese could match, there wasn’t much of a chance to win the war. America would have been bogged down in an earlier version of Vietnam. China was the major participant in this war. Eisenhower, returning from this trip, made implied threats about the use of atomic warfare against China, but he also left room open for negotiation, for an armistice which would leave the line between the opposing armies (known as the 38th Parallel) as the boundary between North and South Korea. Eventually, this armistice was arranged. Eisenhower judged Mao Tse Tung very shrewdly. Throughout his eight years in office, employing judicious threats, sometimes implied, sometimes real, as when he once intimidated the Chinese mainland with nuclear bombers, he always outfoxed the Chinese leader. The Korean Armistice was the first step toward “cooling out” a world that was coming to believe that war was the natural state of things. All through his administration, the generals and senators and statesmen, and the media, on the slightest provocation, cried out for war–and Eisenhower replied No. In 1954, the French were fighting the communists in Vietnam, and losing. Their army was surrounded at a place called Dien Bien Phu, and it looked like the French Army would have to surrender. The French government asked Eisenhower for military assistance; it asked him to use tactical nuclear weapons on the enemy. It is true that nuclear weapons would have wiped out the NVA army that was opposing the French. Eisenhower’s Secretary of State, his Vice President, and his loyal Senate Majority leader supported the use of nuclear weapons to stop the North Vietnamese. Eisenhower said No. One man on the planet saved the world from nuclear war. That man was Eisenhower. For eight years he put out the fires. Often his problems came from a Congress who wanted to increase defense spending. Eisenhower fought against these increases. There were times when he had to fight his own generals, who would testify against his military spending policies before committees in Congress. Sometimes he worked covertly against what he considered unstable situations in other parts of the world, as in the case of a revolution in Guatemala (called Operation Pbsuccess), or another revolution which he destroyed in Iran. For these purposes he used the CIA and subversion and assassination. At other times, he used open threat and intimidation, and it worked. On Eisenhower’s watch, the wars were ended, and numerous potential guerrilla wars and revolutions were dampened down. Another major problem which he inherited was the religion of anti-communism, also known as McCarthyism. Senator Joseph McCarthy, a junior Republican Senator from the State of Wisconsin, was a perfect Saturn/Neptune paradigm (which I will discuss later). All he had to do in a committee hearing was to accuse, not prove, someone of being “communist”, and that person would lose his or her job, status, and sometimes even go to jail. Lives and careers were destroyed. There were suicides. Senator McCarthy was one of the nastier manifestations of sleaze in American history. Such people arise in every civilization. It is a testament to the U.S. system that it was finally able to digest and spew him out. What was Eisenhower’s reaction to McCarthy? Eisenhower maintained complete public silence, never even mentioning the Senator. Eisenhower believed in the principles of the Declaration and the Constitution, especially in the philosophy of the separation of powers. This implies that the executive branch be separated in all its powers from the legislative and the judicial. Eisenhower worked silently behind the scenes to control the damage he believed McCarthy was doing to the government. His public strategy with Senator McCarthy was one of non-reaction. He felt the Senator would destroy himself eventually, if allowed the time to do so. Examining the Eisenhower’s ascent-to-power chart (it is completely accurate, for the exact time of his swearing-in is known’), we find the Saturn/Neptune conjunction sitting in the 6th house. Since it is a synodic conjunction, it dominates the chart and places its stamp on his next eight years as president. The fact that this synod occurred close to his natal Sun and is conjunct his natal Moon on Election Day would further support the hypothesis that Saturn/Neptune was the ruling influence of his administration. This synod is what McCarthyism was all about. Anti-communism was a religion. In this case it was an idolic religion of fear that was beginning to unravel the fabric of American government. It was a subtle and corrupting influence that people could not quite put their finger on. This fear was developing into a sovereign power, which if it remained around long enough, would end up corrupting America’s constitutional freedoms. Sometimes one can meet an adverse energy, a corrupting influence, by using its own energy against it. Eisenhower’s design was to combat this anti-communist madness with silence, subterfuge and non-resistance. He felt this was the best way to destroy McCarthy, who destroyed himself with alcohol. Neptune, when its higher spiritual strengths have not been developed, functions quite well as the self-destructive power of alcoholism. 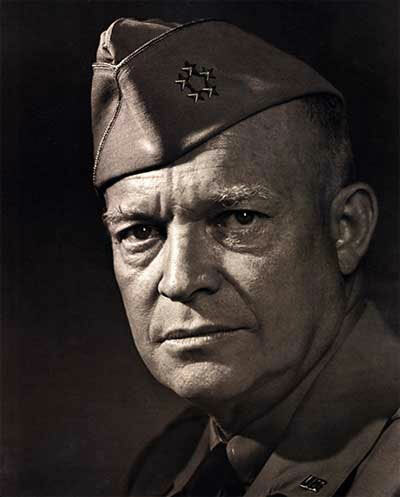 The Neptune archetype was developed in Eisenhower. He used its power to quietly and unobtrusively bring about peace in the world. He used it to throw cold water on the fires of rage and war abroad and at home. He used it to destroy the mad senator. By 1960, Dwight Eisenhower had occupied the centers of world power for twenty years, as SHAEF (Supreme Headquarters Allied Expeditionary Force) commander of the allied armies, as Chief of Staff of the Army, as presidential adviser, and finally as president. Comfortable in the position of leadership, as general and president, he by now enjoyed the exercise of power. Enjoyment of the use of power is an attribute of a great leader. In Eisenhower’s last year in office (as president, he was prohibited by Constitutional law from serving more than two terms) he was plagued by scandal, by accusations from a contentious Congress that the American space program and military preparedness were falling behind the Russian’s effort, by threats from the Russians over the shooting down of a U.S. spy plane, by the resignation in disgrace of his chief-of-staff over a minor scandal. He felt that it was not one of his good years. The Sun represents executive power in a nation’s chart. For much of that year, Saturn was opposed the natal Sun of the 1776 U.S. chart. There have been worse Saturn oppositions; this was a relatively quiet one. It was a warning for Eisenhower: a sign to hand down the mantle of power, to pass it on to a new generation. Some Saturn oppositions signal extremely chaotic times in a nation’s history, a falling apart of its structures. At other times this opposition indicates a rebirth and restructuring.For this American president it was a time of change, of karmic balancing, but there were no major problems. The structure of America, its institutions, its laws, its cultural practices, was changing, but not falling apart. We moved from the quiet 1950′s into the turbulent 1960′s, and the Uranus/Pluto synod was fast approaching. Eisenhower passed on the power of the executive to a new generation of leaders with the same style as had President Washington.